We will focus on the implementation of the typing indicator feature of the application. Now, let's dive into how we built the typing indicator in the chat application. After creating the application, go to the App Keys tab and copy your App ID, Key, and Secret credentials. We will use them later in the tutorial. Now that you have your Pusher Keys, let's get to building the realtime chat application. 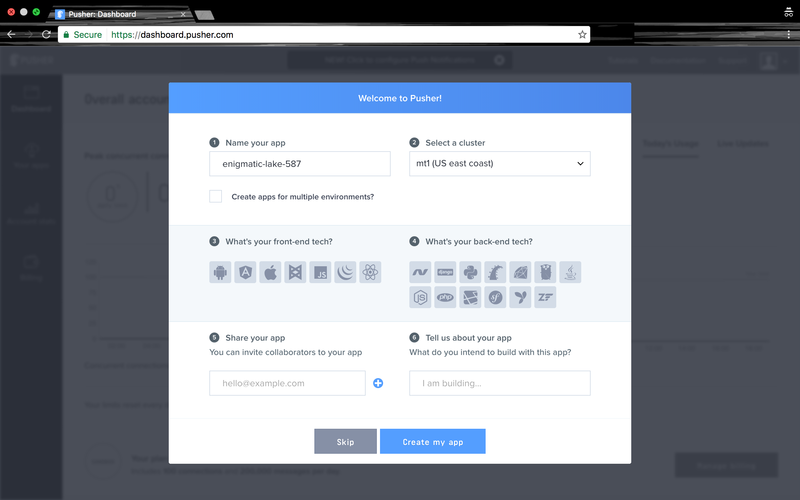 Create routes to serve our application pages and listen for web requests. Next, we create a route that uses Pusher to broadcast a user_typing event. This route broadcasts the request's username to everyone subscribed to the channel. Then start the Express server to listen on the app port 3000. Now we have the application server set up. Next, we develop the chat application's user interface and functionalities. Top Menu: This contains the application title and a section to show who is currently typing. Messages: This contains a list of all messages sent and received. Input: This contains the text field to input messages and also contains the send button. Now that the user interface is set up, let us add the typing indicator to the application. Before we proceed to the implementation, let me explain how the typing indicator functionality will work. When the user starts typing in the message text field, the page sends a request to the server. The server then broadcasts this to everyone as a Pusher event. The page would also subscribe to the user's typing event from Pusher and show a 'user is typing' message when a broadcast is received. Now, open the public/js/app.js file for their implementations. First, we need to initialize Pusher and some other variables. Next, we need to listen to the current user's input events and publish their username. This would post a 'user is typing' event for each input in the message text field. While this is good, it is not optimal because every input will make a call to the server. A better way to do this is to throttle the rate at which we post events to the server. Throttling is a technique used to ensure a particular code is executed only once within a specified time interval. So let's update our code to ensure we only post typing events to the server once every 0.2 seconds. To explain the code, the canPublish boolean is set to false immediately after we post a 'user is typing' request to the server, preventing us from posting more requests. We then set a timeout function that sets the canPublish boolean to true after 0.2 seconds, thus allowing us to post another request to the server. This way, we throttle the requests made to the server. Next, let's see how we will subscribe to the user_typing event. So, if the username of the event is not the current users' username, we show a 'user is typing' text on the web page. The application now updates the web page with the username that is typing. But the 'user is typing' message needs to be cleared when the user stops typing or else the message stays forever (and we definitely don't want that). An easy solution is to set a timer that clears the 'user is typing' message after some seconds of not receiving an event. From experience, a clear timer of 0.9 seconds has given the best results. To explain the code, the userIsTypingEvent will clear the 'user is typing' message after 0.9 seconds of not receiving a broadcast. The application should be running now. Visit the chat web page at http://localhost:3000. To try out the typing indicator feature, open two of the chat web pages beside each other. When you start typing in one, you should notice the other window shows that you are currently typing.